The performance, premiered a few weeks ago in the famous New York avant-guard theatre La MaMa, was greeted with great surprise and success. 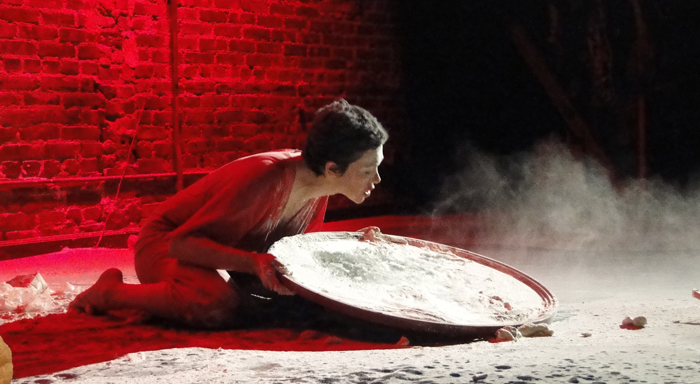 In this performance the artist explores the intimate relationship between food, as a link to tradition, emotion, the past and a strong desire for the future, for dreams, for change. Ciriaca+R goes on a journey to discover her own destiny, and it draws us into a psychological struggle in search of a past and a future. Curated by Rossella Canevari, scheduled from May 26 th to June 3, the exhibition includes works by nine contemporary artists: Alessandro Bazan, Paola Citterio, Ciriaca + Erre, Silvio Giordano, Julia Krahan, Michela Martello, Lucia Pescador which interpret Italian wine and food excellences. The exhibition now opening in Los Angeles, was first seen in New York and Milan. The exhibition offers a broader perspective of food and different issues related to it: each artist challenges the viewer with works that impact and suggest a new and fascinating journey to discover a different identity tied to food culture and its socio-cultural interactions. (Also the title of the work) that the artist has scratched, clipped, cut into the fur in striking contrast. Below emerge from the fur, side by side, heads and hands in chocolate, of children in prayer over hundreds of chocolate coins, a small prayer within which lies the dormant courage to ask of ourselves, of life, a bigger question. the artist wants us to reflect on our desires, fears and strengths inheIn As Ciriaca+r says: " They taught us not to question when we were little. In school we learn what somebody else discovered, wrote, experienced, yet even the biggest historical changes, any discovery big or small, have been made by those who had the strength to ask the right questions of him or herself, of life, of the people around them. We live in a society full of information, of apparent freedom of choice, but aren’t we actually governed by a fear of asking something more of life, to desire different politics, a different life, different rules or even no rules?"